After a hearty dinner at the unagi don joint, we walked down Kawaramachi Dori towards our next destination. We usually end the day with a dessert and today’s no exception. However, we could enjoy the desserts at the comfort of a sit-in dessert boutique instead of takeaways which we had over the last few days in Japan. 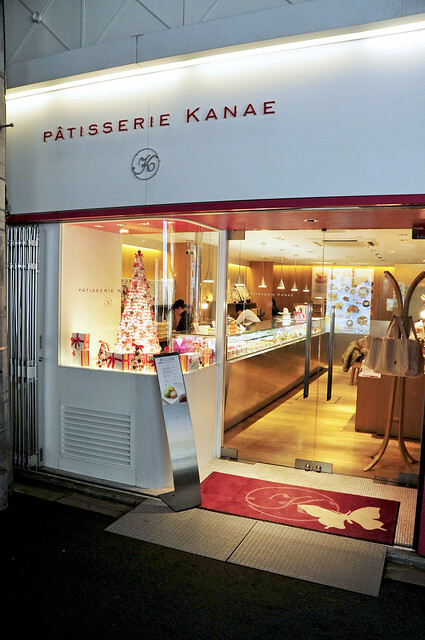 Shop space is so limited in downtown Kyoto and Pâtisserie Kanae is no different. But we were glad we’d managed to make time in our itinerary for a trip down here. After putting down our stuff, it was off to the counter to choose our desserts! Despite being passed 8 pm, there was still a good selection left, probably because it’s a weekday evening afterall. 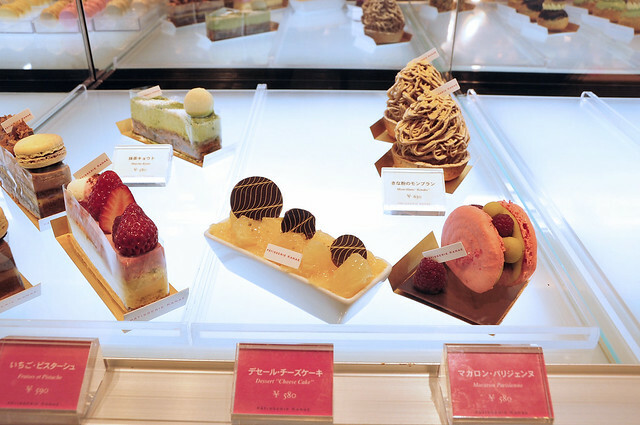 From left to right, there’s “Saku-Saku Chocolat“, “Fraise et Pistache“, “Desserts Gateau de Fromage” and “Matcha Kyoto” and “Mont Blanc Kinako” in the background. We’d wanted to try “Matcha Kyoto” but the last remaining piece wasn’t very “photogenic” unfortunately. After much deliberation, we’d finally settled for 2 of their macaron creations. 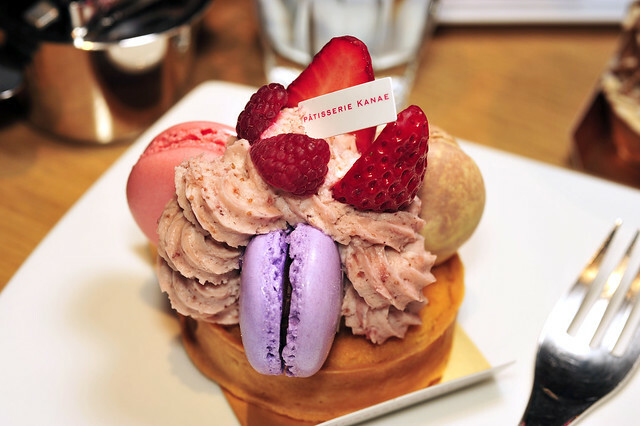 Pâtisserie Kanae is afterall well-known for their macarons and I’m sure they would be worth a try. 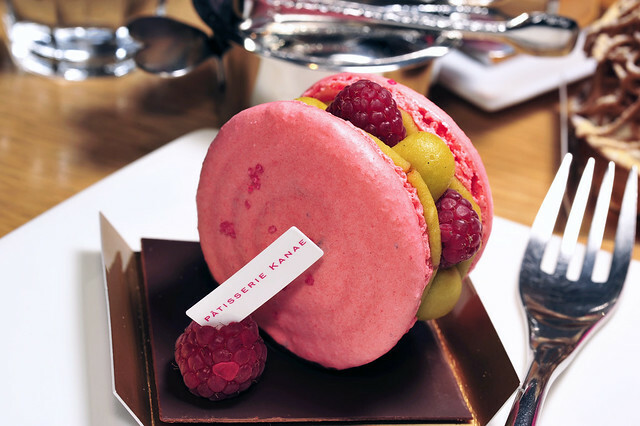 With oversized, rose pink macaron shells, Macaron Parissienne echoes of Pierre Herme’s Ispahan. The pistachio buttercream was very delicious and subtle, unlike most other macarons which we’d tasted before that tend to be overtly sweet and heavy. The one concocted for this was entirely manageable, nicely balanced by the sourness of fresh raspberries. The whole piece was set on a thin dark chocolate plaque which added depth to the macaron, giving it a more all rounded finish. Tarte Macaron is another macaron creation using pâte sucrée baked in crème frangipane as a base. 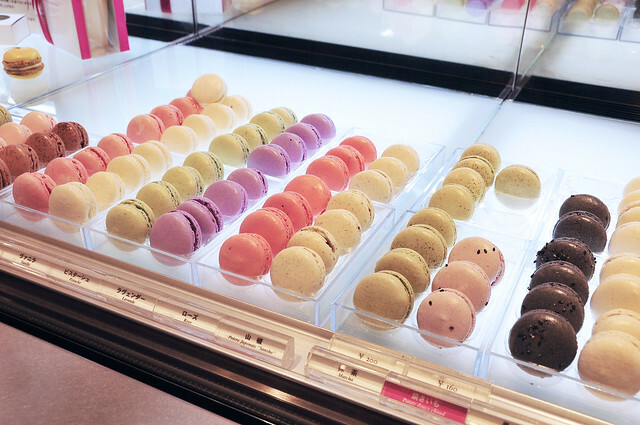 Its topped with buttercream embellished with morsels of strawberry for a more varied texture, and 3 macarons namely lavender, rose and fruits de la passion chocolat. While the former two floral themed macarons are nicely aromatic, my personal favorite is the chocolate and passionfruit concoction. Unlike Pierre Herme’s Macaron Mogador which uses chocolat au lait, Kanae opted for a darker and more robust chocolat noir which cut through the acridity of passionfruit. 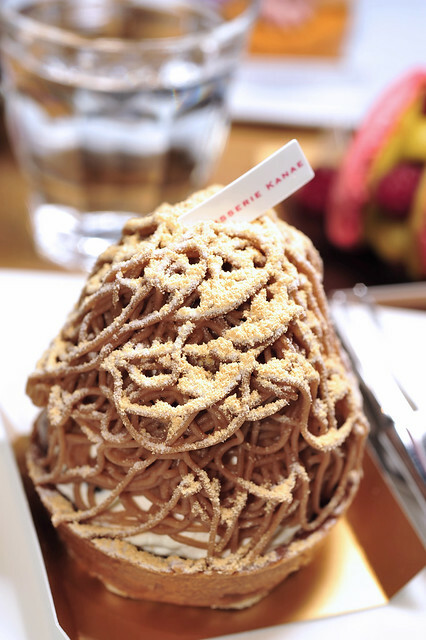 We cannot resist a Mont Blanc when we see one and Kanae’s Mont Blanc ‘Kinako’ is no exception. Like Pâtisserie Sakai which we’d tried the day before, Pâtisserie Kanae attempted to infuse Japanese elements into this classic dessert with the use of きなこ “Kinako” soy bean powder which is commonly used in wagashi 和菓子, especially in 厥餠 warabi mochi. The contents however, remains rather Mont Blanc like, with the use of strings of marron pate and creme chantilly inside, not forgetting whole chunks of marron glace. There were also a few candied Tamba black beans 丹波蜜黑豆 within the creme chantilly which is not shown in the photo. All these occurred above a pâte sucrée – crème frangipanetart base. On the whole, we felt that this was better than the Mont Blanc d’ Argent we’d had from Pâtisserie Henri Charpentier for breakfast for the sole reason that the bitterness from kinako provided good blance for the sweet marron pate and honeyed marron glace within. 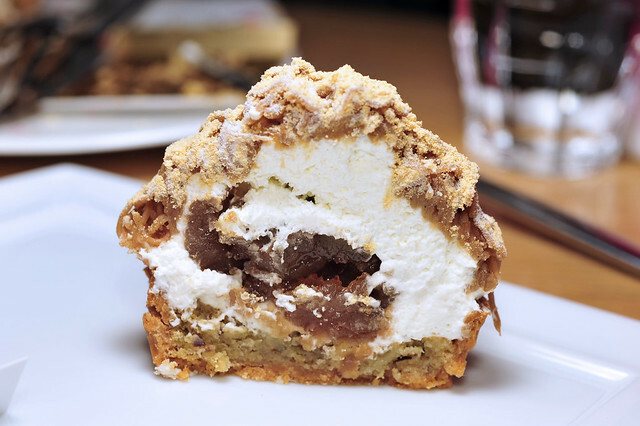 This makes dessert making a “very real” business as its clear that this mont blanc is set to be more than just being one-dimensional. however, we can’t help feel that more could have been done to make it more “colloquial”. But “deconstructing” such a classic would almost amount to commit sacrilege! A delicate balance to maintain indeed. 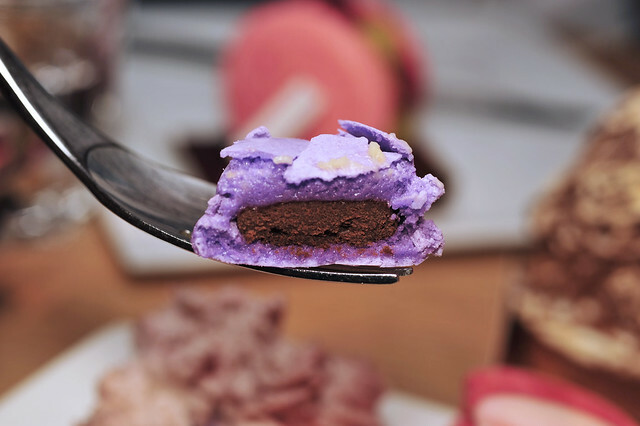 A peek into the lavender infused ganache filling of the lavender macaron. 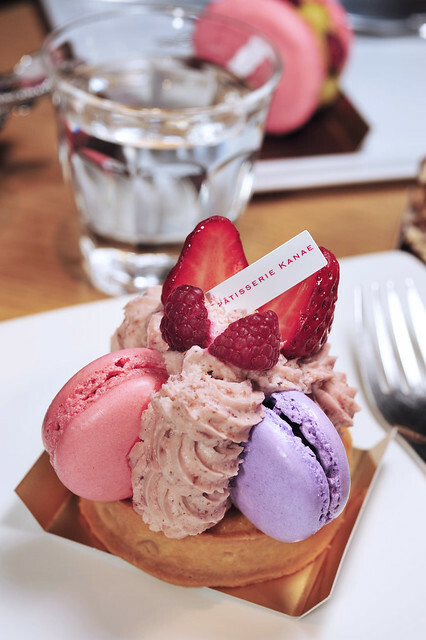 Tarte Macaron is crowned with a fresh strawberry cut into quarters. Beautiful shiny shells, made using the italian meringue method, as I was told during a chat with the store manager. We didnt get to meet Ms Kobayashi in person as she was then at La Petite Cherie, her own baking school during the time of our visit. The shop also has a small corner offering petit four secs including a good range of sables, madeleines and other mignardises. This entry was posted on September 13, 2011 by Alan (travellingfoodies). 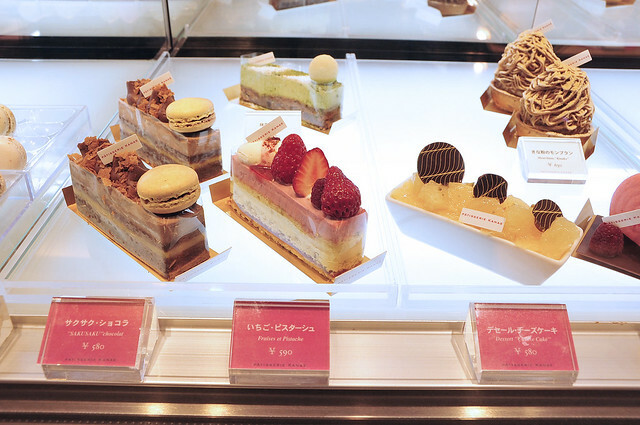 It was filed under Food, Travel and was tagged with canelé, Japan, kanae kobayashi, kanae patisserie, kobayashi kanae, Kyoto, macaron, mont blanc kinako, 小林かなえ, 小林香苗, 京都. Definitely heading here if I get myself to Kyoto one day! 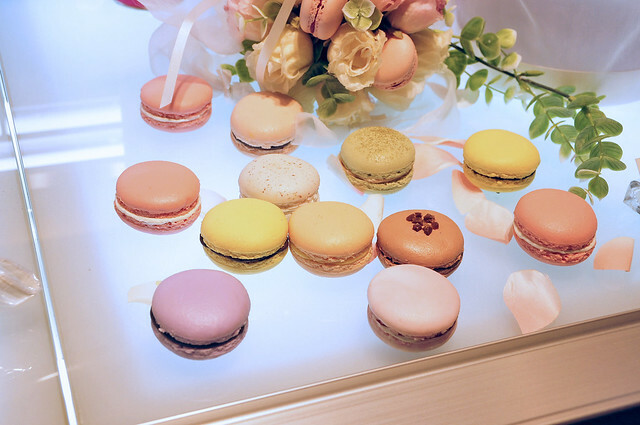 Love how the tarte macaron looks! And the courtesy of the Japanese people is something I can’t get over too! 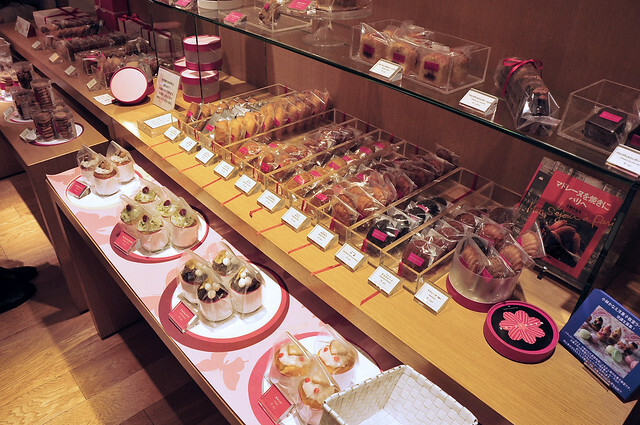 I wish one day I can visit Japan and savour those goodies that you posted. same same! can’t never get enough of Japan. such a lovely place with lovely people. Sigh, if only the people in Singapore are as civilised and courteous. such a kind lady, really nice. I think all of us ought the follow these examples too. 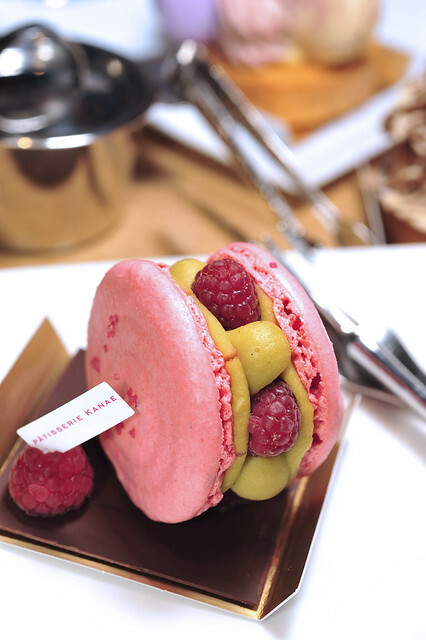 yeah, that macaron parissiene resembles the ispahan tart that you made. All of these look so beautiful! 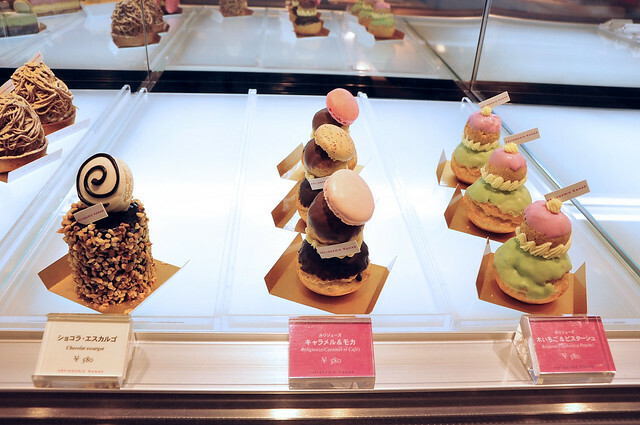 do most of the pastries shop have similiar designs and decorations of their macarons..i mean are those choc escargots (and the other 2 next to it) common in japan or you can only find it in this shop? yeah, that gesture most certainly caught us by surprise. And what’s interesting is, it seemed so natural for them to do so. I guess it all lies in their culture of not wanting to “impose or be of inconvenience to others”.